SKILD’s therapists serve students from all socio-economic backgrounds. when the team from the Center for Smart Kids with Individual Learning Differences (SKILD) comes on the scene. They’re bringing about lasting change at the micro and macro levels, impacting individual children and families as well as the larger society, through a strategic combination of efforts and programs. SKILD therapists use current tests & therapies, fully adapted for Lebanese culture. The SKILD team is a group of therapists and psychologists who offer professional therapy and assessment services at their center in Mansourieh (a suburb of Beirut), but whose vision goes even further than this important task. Their work also involves interacting with parents, grandparents, and siblings, giving them hope and equipping them to communicate with and support a family member with special needs or learning differences. And in Lebanon’s academically rigorous, competitive climate, the team is committed to advocating for inclusive school polices and student-based teaching strategies that have been uncommon in the Lebanese school system. Children come after school for therapy & tutoring. SKILD therapists available in Mansourieh for testing, tutoring, therapy, and consultation. The SKILD team has documented the need for greater steps toward inclusion, and for programs or services to be offered for students with learning differences, in public and private schools across Lebanon. They are in schools weekly, offering additional resources and training for educators working with children with special needs and raising community awareness about the realities of learning difficulties. 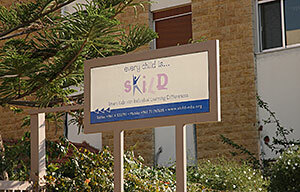 A major feature of SKILD’s awareness campaign has been the National Day for Students with Learning Difficulties, launched in 2013 with the support of Lebanon’s Ministry of Education and the British Council. The SKILD Center also features a new multi- sensory area which allows them to offer even more services, such as teaching social and life skills, music, drama, art and providing a room uniquely designed for sensory therapy. It’s through these tangible, need-sensitive moments, as well as through their hard work towards the long-term goal of a culture of acceptance and respect for learning differences, that the SKILD team is demonstrating God’s love and promoting the flourishing of kids and families in Lebanon.